The most serious work on the family Callichthyidae published including aspects of biology on Corydoras and relatives Brochis and Aspidoras and the larger relatives Hoplosternum, Callichthys and Dianema. South American 'big cats' such as Red Tails, Shovel Nosed and Pimelodus types. Driftwood catfishes are also pictured and discussed along with aquarium care. The largest volume of the series (300 pages - hundreds of full colour pictures and illustrations) covering three major families of South American catfishes - from the loricariids (suckermouths), Banjo and Talking catfishes groups including sailfins, whiptails and plecs. 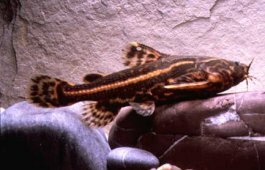 All the strange and weird catfishes from Asia, Africa, South America and Australia including shark cats, Chaca Frogmouth, Mystus, electric cats, walking cats and North American bullhead cats and more. PREPAYMENT OF ALL BOOK ORDERS IS REQUIRED BY CASH or postal order (REGISTERED MAIL) OR BY A CHEQUE PAYABLE (to Dr David Sands) (OVERSEAS ORDERS - PAY PAL OR THE CHECK MUST BE PAYABLE AT A UK BANK - MOST BANKS HAVE ARRANGEMENTS WITH UK BANKS). Cash orders are despatched same day - cheque orders after five bank days.